Ann Arbor city council meeting (July 16, 2012): The bulk of the council’s recent meeting was related to parks – either directly or tangentially. The council considered a resolution that would have placed a question on the Nov. 6 ballot about a charter amendment affecting city parkland. The amendment would require a voter referendum not just for the sale of parkland, but also for leases or other contracts that have a practical effect similar to a sale. The majority of the council wanted to allow time for the city’s park advisory commission (PAC) to weigh in before taking council action. To facilitate that timeline, PAC is convening a special meeting on Aug. 8 to consider the matter. 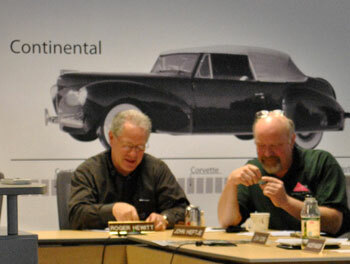 The council’s postponement was until Aug. 9 – its next regularly scheduled meeting. That’s a Thursday instead of the usual Monday, pushed back because of the Aug. 7 primary election. Other park-related items on the agenda included approval of a $89,560 contract with Wally Hollyday Skateparks for the design and construction oversight of a skatepark to be built in the northeast corner of Veterans Memorial Park. The council also gave initial approval to the rezoning of two parcels recently acquired by the city for expansion of the Bluffs Nature Area at 1099 N. Main St., north of Sunset Road. On final approval, both parcels will receive the PL (public land) zoning designation. The city expects the additional land to make the entrance to the nature area more accessible. The Leslie Science and Nature Center will get $115,309 worth of improvements to create accessible pathways at the city-owned site – the council approved a contract with JB Contractors Inc. for that work. The center is operated by a separate independent nonprofit on land and buildings that are owned and maintained by the city of Ann Arbor. The possibility of a mixed-use park and art center at the city-owned 415 W. Washington property was given a chance to move forward, with the council’s authorization of $50,000 in general fund money to pay for physical surveys of the building on the property. The building, which would potentially house a space for working artists, would need environmental, hazardous materials and topographic surveys done, even if a decision were ultimately made to demolish the building. Open space outside the city got a boost from the council’s acceptance of $396,900 in federal funds for the purchase of development rights (PDR) on properties in Webster and Superior townships. The federal funds will be matched with city funds from the open space and parkland preservation millage, which supports the city’s greenbelt program. The wetlands at Plymouth Parkway Park that were impacted by last year’s railroad embankment washout along Plymouth Road will be restored through a $97,687 contract with Fonson Inc. authorized by the council. The funds will come from the city’s park maintenance and capital improvements millage. Only tangentially related to parks was the council’s approval of the site plan for the Maple Cove development. Located on 2.96 acres at 1649 N. Maple, north of Miller Road between North Maple and Calvin Street on the city’s west side, the plan calls for combining two sites – 1649 N. Maple and 1718 Calvin – and demolishing an existing single-family home and detached garages there. Two 3-story apartment buildings would be built with a 64-space parking lot. 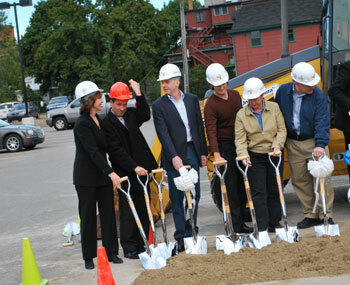 The project also includes building a private street to serve seven new single-family houses near Calvin Street. The parks connection to Maple Cove is that the city requested a $26,660 contribution from the developer to support the city’s parks – a voluntary contribution, with the amount determined by formula. The developer has declined to make that contribution. The council also voted to appoint John Seto as chief of police and head of safety services – he’s now permanently in charge of policing the city, including city parkland. Seto has served since April as interim in the wake of Barnett Jones’ retirement. Ann Arbor park advisory commission meeting (June 19, 2012): Park commissioners took action on three items that now will likely be on the Ann Arbor city council’s July 16 agenda: (1) a contract for the design of a proposed Ann Arbor skatepark, (2) path renovations at Leslie Science & Nature Center, and (3) a parks millage renewal. An $89,560 contract with Wally Hollyday Skateparks – for design and construction oversight of a new skatepark at Veterans Memorial Park – was unanimously recommended for approval. Trevor Staples, president of the Friends of the Ann Arbor Skatepark, was on hand to answer questions, and several commissioners congratulated him for spearheading this project. Staples noted that fundraising is still underway, focused now on building a $100,000 endowment for future maintenance. Funding for design and construction of the skatepark has been secured primarily from a $300,000 state grant and $400,000 from the Washtenaw County parks & recreation commission. PAC also unanimously recommended approval of a $115,309 contract with JB Contractors Inc. to build barrier-free pathways at the Leslie Science & Nature Center. The recommendation includes a 10% contingency, for a total project cost of $126,840. 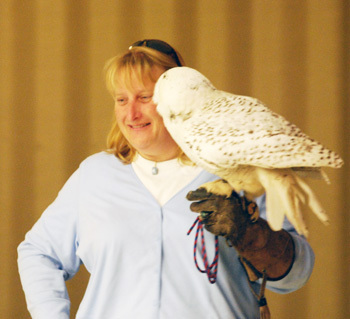 This first phase of a broader renovation project on the center’s grounds will include making the raptor enclosures – housing owls, falcons, a bald eagle and other birds of prey – more accessible. The center, located at 1831 Traver Road, was previously part of the city’s parks system, but since 2007 has operated as an independent nonprofit. However, the city still owns and maintains the buildings and property. 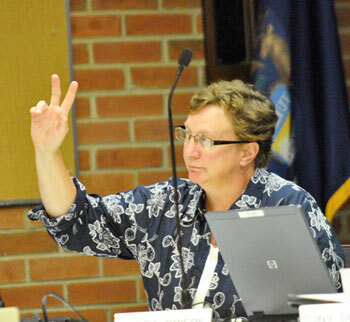 Also unanimously recommended for approval was placement of a millage renewal on the Nov. 6 ballot. The current 1.1 mill Ann Arbor park maintenance and capital improvements millage expires this year. A renewal would run from 2013-2018 and is expected to generate about $4.9 million next year. The June 19 meeting included a quarterly financial update, and the election of Tim Doyle as chair of PAC’s budget and finance committee. Commissioners also were briefed on a Traver Creek streambank stabilization project at Leslie Park golf course, designed to improve the water quality of this Huron River tributary. Other water-related issues were brought up during the parks and recreation manager’s report. Colin Smith told commissioners that final repairs on swirl concentrators at West Park – designed to help stormwater management – will start later this month, with final renovations of the park occurring over the summer. And city staff will be harvesting Eurasian watermilfoil from about 6-7 acres around the Gallup Park canoe livery, using what Smith described as a “Zamboni on the water.” The aquatic plants have overgrown the area around the livery, making it hard for people to use paddleboats, canoes and kayaks. During public commentary, Alan Haber urged commissioners to support the Library Green project, a citizen-led effort to put a public commons on top of the new city-owned Library Lane underground parking structure. He invited PAC to a July 14 “Imagine a Park” block party on the site, from noon until 5 p.m. Later in the meeting, park commissioner Tim Berla picked up the idea, saying he wasn’t advocating for that particular project but that he felt PAC should be “in the game” for discussions of a downtown park. 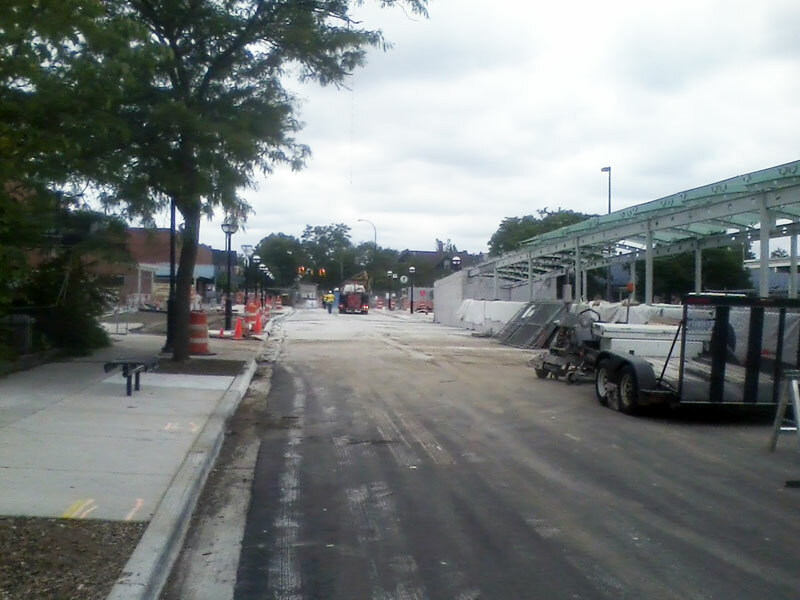 South Fifth Avenue in downtown Ann Arbor – one-way southbound between Liberty and William – will not be re-opened to traffic until sometime in mid-June. The street has been closed since August 2010 in connection with the construction of a new underground parking garage on the east side of Fifth, which will offer around 700 spaces. The city’s public parking system currently has 6,956 spaces. Ann Arbor Downtown Development Authority board meeting (May 2, 2012): The one action item on the board’s agenda was a resolution directing its operations committee to start applying demand-management principles to the pricing for permits in Ann Arbor’s public parking system. The resolution, which passed unanimously, notes that the goal of the pricing strategy is to attract patrons to those structures that are located farther away from the University of Michigan campus. One of those structures farther west of the campus is the new underground parking garage on South Fifth Avenue, which is nearing completion. The garage, which the DDA is currently calling the “Library Lane” parking structure, is now expected to open by the time the art fairs begin, which this year fall on July 18–21. South Fifth Avenue between Liberty and William is expected to re-open by Memorial Day. A characterization of that timing as “on schedule” was disputed during public commentary by Ali Ramlawi, owner of the Jerusalem Garden restaurant. Jerusalem Garden is adjacent to the construction site. Ramlawi noted that the structure was originally due to be completed by August 2011. The future use of the top of the underground garage was the subject of public commentary from advocates who’d like to see it used as a green plaza. That suggestion was met with remarks from mayor John Hieftje, who sits on the DDA board, with a description of his expectation that three major parcels would soon be incorporated into the city’s park system – 721 N. Main, 415 W. Washington, and the MichCon property (located between the Amtrak rail station and the Huron River near the Broadway bridges). Hieftje’s point was that the additional financial burden for the maintenance of those parcels as parks might impact the city’s ability to add a downtown green plaza to the park system. Requests for better information about the parking system and suggestions for disseminating information about the availability of open parking spaces were topics of additional public commentary. 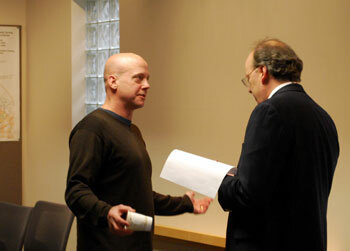 The committee has been discussing a proposal by Dan Ketelaar for support of a proposed development at 618 S. Main, which received a positive recommendation from the Ann Arbor planning commission on Jan. 19, 2012. If the project moves forward, the 7-story building would include 190 units for 231 bedrooms, plus two levels of parking for 121 vehicles. Ketelaar has estimated that the tax on the increment between the current valuation of the property and the final built project would yield around $250,000 a year in TIF (tax increment finance) revenue to the DDA. If adopted as it’s currently worded in the draft, the formula in the policy would translate into up to $625,000 of support for 618 S. Main. When The Chronicle first reported that the one-block stretch along South Fifth Avenue – between Liberty and William – would be closing on Aug. 1, the Ann Arbor Downtown Development Authority hadn’t yet finalized contingency plans for the change, which will affect one of the city’s main southbound arteries through most of 2011. 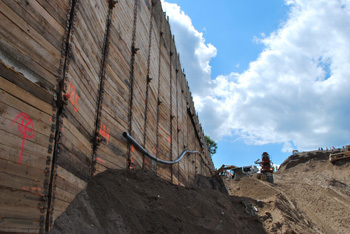 The view from the bottom of the construction site for the South Fifth underground parking structure, facing Fifth. The project's next phase requires shutting down southbound Fifth between Liberty and William, starting Aug. 1. This week, the DDA – which is managing the closure as part of the construction of the underground parking structure on South Fifth – released more information about changes in traffic routes and parking, related to the closure. Ann Arbor District Library board meeting (June 21, 2010): Construction in the area surrounding the downtown library came up in a couple of ways during the library board’s June meeting held this week. The view from the entrance of the downtown Ann Arbor District Library, looking west. In the foreground is construction from the Fifth Avenue streetscape project. Across the street is a city-owned surface lot that will be closed when the AATA rebuilds the Blake Transit Center, seen to the right. Vibrations from work on the Fifth Avenue underground parking structure, just to the north of the library building, have caused problems with the building’s HVAC system – the library temporarily lost air-conditioning as a result. In a related move, the library board voted to award a contract for HVAC maintenance and repair to Pace Mechanical, despite arguments that it should go to a local company. And in her director’s report, Josie Parker noted that a public parking lot used by library patrons will close as early as next spring, due to the rebuilding of the AATA’s Blake Transit Center. The city-owned surface lot is located at the northwest corner of Fifth and William, directly across from the library. 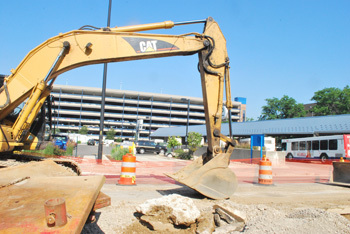 The Chronicle followed up with the Ann Arbor Downtown Development Authority, which oversees management of the surface lot for the city, for more details on possible contingencies for patron parking, as well as other access issues that could arise when Fifth Avenue along that block is closed for at least a year, starting Aug. 1. 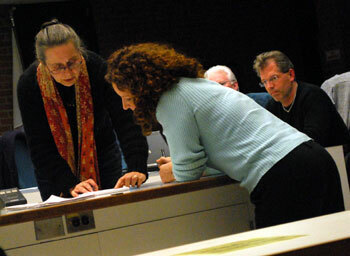 Ann Arbor City Council Sunday Caucus (Nov. 15, 2009): Around two dozen residents came to city council chambers Sunday night to convey their thoughts on two major planning issues on the city council’s agenda for Monday. The downtown zoning ordinance package – known as A2D2, which the council has approved on two prior occasions at a “first reading” – will be given a public hearing, with a vote also scheduled for Monday night. In addition, the downtown design guidelines will have its public hearing continued, which started on Oct. 5. No vote on design guidelines is scheduled for Monday. Also receiving discussion at caucus were the six projects that were submitted before last Friday’s Nov. 13 deadline, in response to the city’s request for proposals to use the space on top of the Fifth Avenue underground parking garage. Also the council’s agenda, but not receiving discussion among councilmembers who attended the caucus, is the council’s formal acceptance of the Huron River and Impoundment Management Plan (HRIMP) from the city’s environmental commission – but not the plan’s recommendations related to Argo Dam. And a consent agenda item that requests funds to purchase additional electronic parking meter equipment contains in its description a plan to install meters in new areas that have not been previously identified. DDA Buys Shelter Beds; New Life for LINK? Downtown Development Authority board meeting (Nov. 4, 2009): Measured in raw dollars, the major news coming out of the DDA‘s regular Wednesday meeting was the selection of The Christman Company as the construction manager for the Fifth Avenue underground parking garage. Because the firm had already been awarded the pre-construction services contract, with the construction management contract to be contingent on performance during pre-construction, Christman’s probable selection was well known. The dollar amount of Christman’s guaranteed maximum price is now also known to an exact figure: $44,381,573. In other significant business, the board passed a resolution authorizing support of an initiative to increase the number of shelter spots for the homeless in the face of the coming winter – $20,000 for additional beds, to be paid for out of the DDA’s housing fund.